The land of a Thousand Hills, Rwanda is a green undulating landscape of hills, gardens and tea plantations. And imagine, amidst this, you have set out on one of the most dramatic, thrilling and poignant wildlife experiences possible. Often described as the 'life changing' experience, it is truly a unique moment to see, observe and learn the lives of the mountain gorillas and that too in their natural habitat, up close and personal. 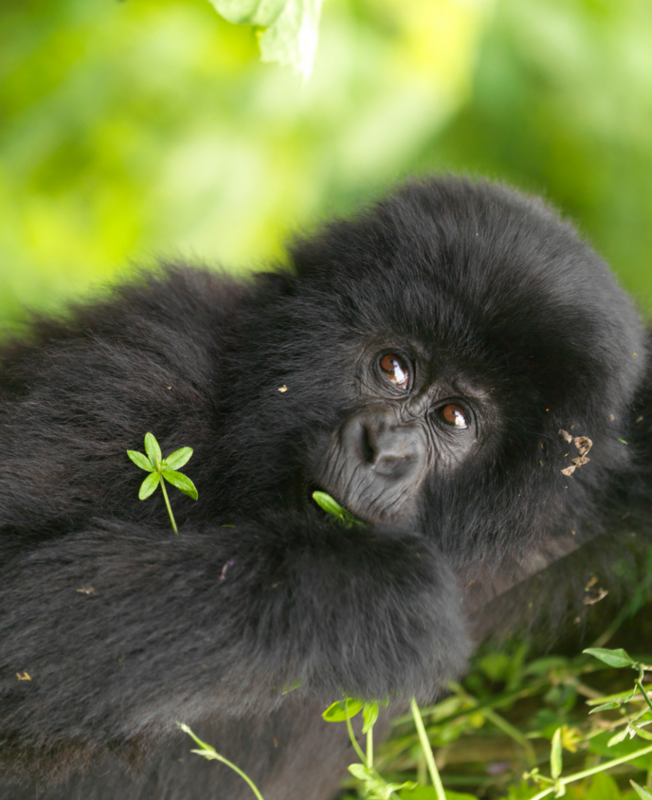 There are only 700 mountain gorillas remaining on earth. 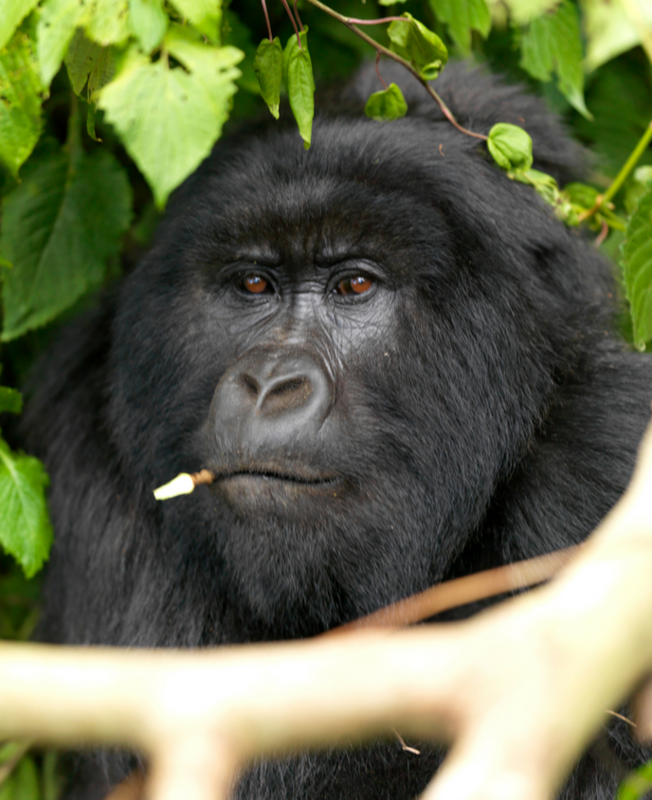 And a majority of them populate the ever mysterious and misty mountains of Virunga in Rwanda. Feel like the real life Indiana Jones as you trek the mountains and track the denizens of these deep forests as if on a quest to discover a hidden secret lair of these rare primates. Stay in the proximity of the Virunga mountains, right at its foothills. Gorilla tracking is a professionally conducted activity. Your fitness level, your health, your patience and your temperament play a major role. 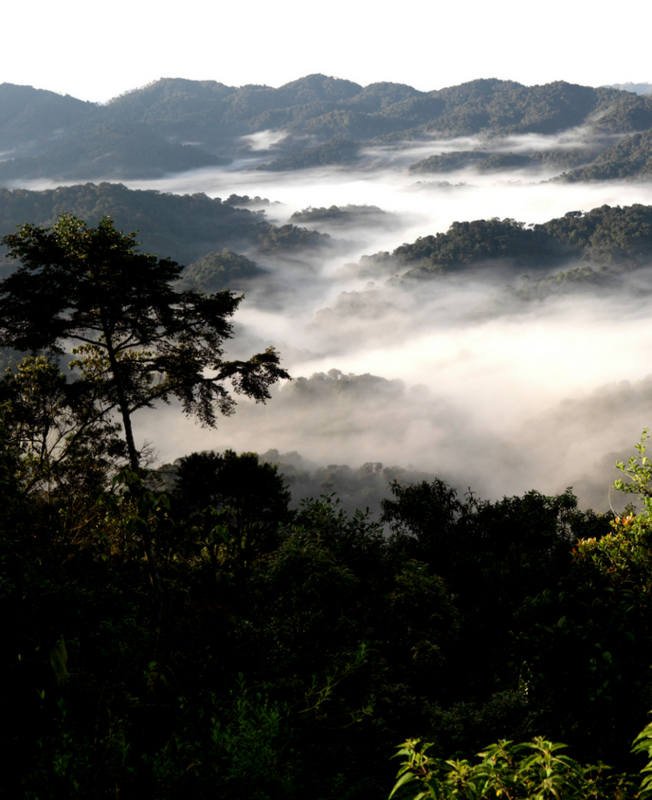 It will involve trekking in the forest which is verdant, humid and somehow light with no discernible trekking paths. Once you have tracked a gorilla family, you are assigned an hour to marvel at how incredible, graceful and peaceful these animals are, especially considering their incredible size. You’ll be amazed when you see the silverbacks (mature males) get up and move around showing control over the territory. One permit entitles only one day's visit, however, you can purchase further permits in case you want to go for multiple visits.But it is subject to availability! Post your thrilling time with the gentle giants, you can also opt for other experiences that Rwanda offers! Visit the Nyungwe Forest National Park, which is the 2nd most visited national park of Rwanda due to its Chimpanzee trek and Canopy walk, thereby making your trip a 'primate special'! Your trek starts in the cultivated foothills of the Virunga’s offering stirring views in all directions. Our experienced trackers, who have spent their entire lives in or close to this forest, soon bring us up close with one of the Gorilla Families. Upon sighting the gorillas, you will stay with them for a magical hour as they go about their daily life, feeding, playing, resting; raising their young. Coming face to face with a giant silverback must truly be one of the greatest wildlife experiences on earth! Sabyinyo Silverback Lodge property extends over some 7 hectares (about 17 acres) and is a haven for all kinds of local birds that do not easily thrive in the surrounding agricultural plots, where the natural shelter is rare and disturbance by human activity high. Over 40 species of birds (of which a few species and or sub species are endemic to the Albertine Rift forests) have been identified in and around Sabyinyo Silverback Lodge. The history of Rwanda dates back centuries, Kigali has been a part of it for 100 years. Visit the Kandt museum, see old Kigali and the craft centres then visit the genocide memorial site. 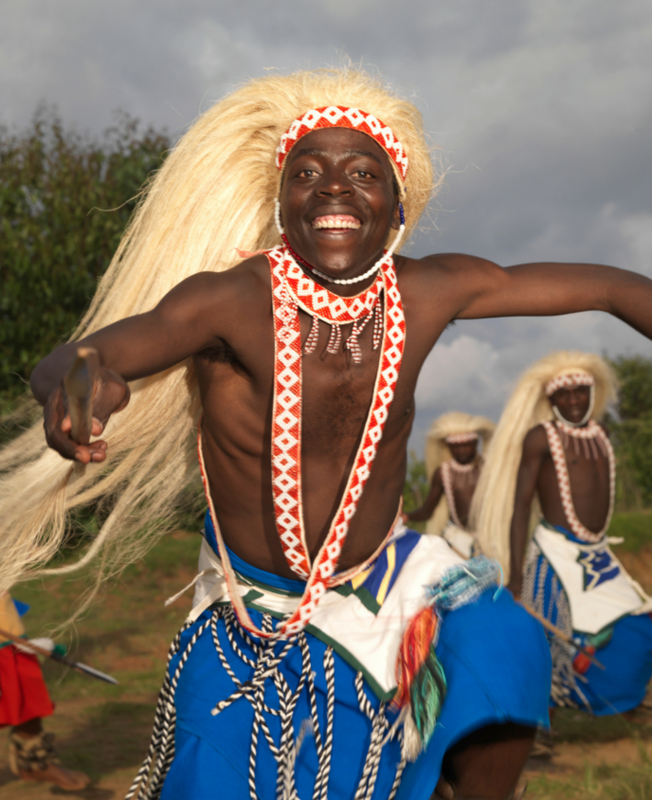 Learn about Rwanda’s history from pre-colonial times to the 1994 genocide; learn about other genocides in the world and how this country has dealt with that past. Tour more and see the new developments in Rwanda; the recovery has been incredible, a testament to humankind’s resilience. Formed by centuries of geologic activity centred around the Virunga volcanoes next door, the 1.25-mile long Musanze caves are located just outside of the town. With an enormous opening, the greenery outside spilling over into the twilight within makes for a fantastic photo op. Karisoke scientific base was established by Dian Fossey in the saddle area between two volcanoes. The camp site stands at an altitude of around 3000m (over 9000 ft) and was abandoned during the unrest of the 1990’s. At around 3400m, Mt M’gahinga is the smallest of the six volcanoes in the Virunga Rage. As from January 2010, the trail leading to the summit crater is open again to visitors. Compared to the other volcanoes in the Virungas, Mt M’Gahinga makes a pleasant climb and has several interesting features like its volcanic caves. Mt Bisoke stands at 3700m, it has the typical conic shape of a “perfect” volcano and in its crater lies a deep crater lake. For those interested in climbing Mt Bisoke the volcano does not present an exceptionally demanding climb but it is nevertheless still a tough hike. The high elevation demands extra strength of climbers and the whole excursion can take between 5 hours and the whole day depending on the speed of the walk and the frequency of stops. If one day with the Gorillas feels less, go for another trek on your free day, probably to a different family this time. Grab another opportunity to spend more time with these primates. 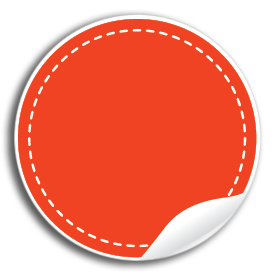 This, however, needs to be advised at the time of booking to acquire required permits in time. 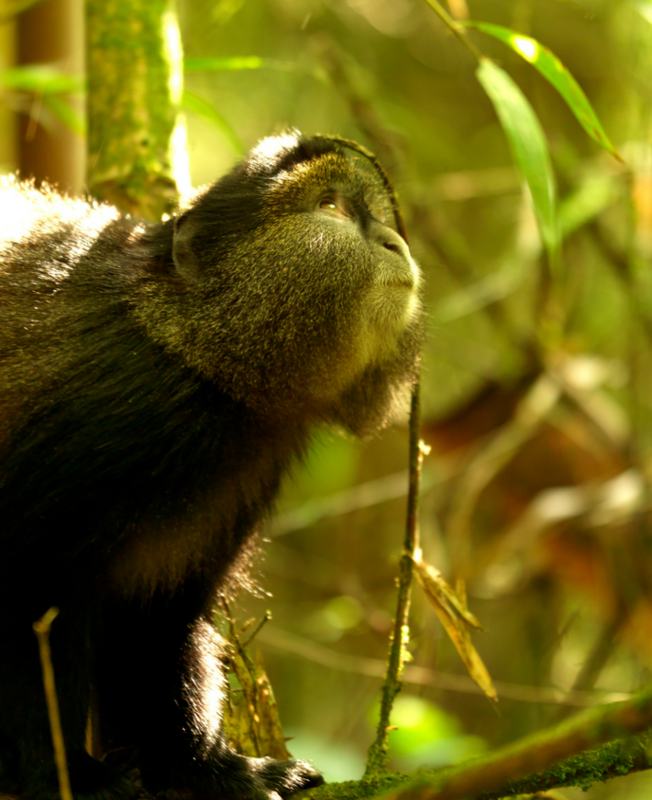 Trekking to see the golden monkeys is another highlight of Volcanoes National Park. The Golden Monkey, is a local subspecies of the widespread Sykes Monkey, also known as the “Blue Monkey” and is endemic to the high altitude forests of the Volcanoes National Park area. The monkeys are playful and inquisitive and often spend their time leaping from bamboo branches or frolicking on the forest floor.